A Gold Membership to Lsect is the ultimate way to ensure that you are always fully briefed and ahead of the game. 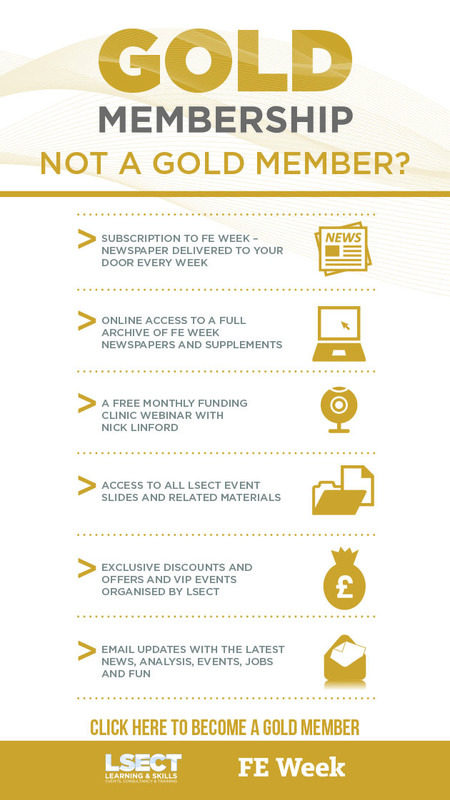 Membership provides a comprehensive set of benefits ranging from Lsect event discounts (£50 minimum) to a subscription to FE Week. Only Lsect Gold Members have access to all of the materials and resources that we produce. Gold Members, upon registration, automatically have access to the Gold Member resources section of the website. This section hosts an archive of resources authored and produced by Nick Linford. Gold Members also receive access to a free monthly webinar clinic with Nick Linford. These webianr clinics are a great way of receiving the latest updates from Nick and to also have your questions answered. Membership also includes an annual subscription to FE Week , the only newspaper dedicated to the further education and skills sector. Members’ weekly edition of the newspaper also contains a sweet treat. > Exclusive super reduced ticket price to the Annual Apprenticeship Conference in March 2019.